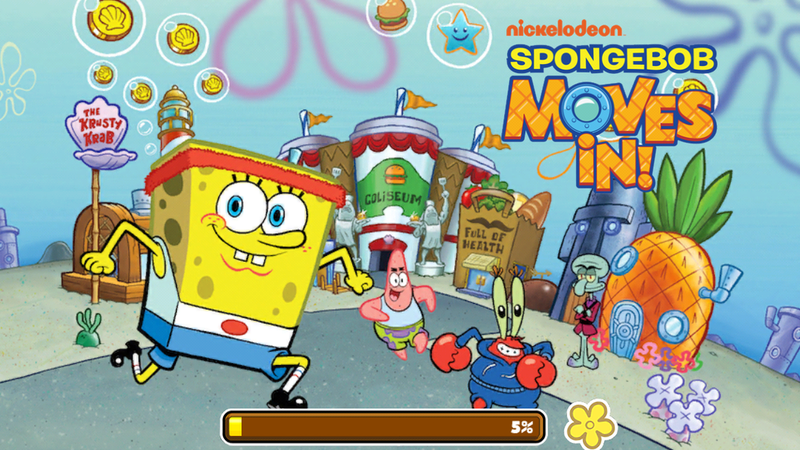 Bikini Bottom Games 2014 - The SpongeBob Moves In Guide Site! 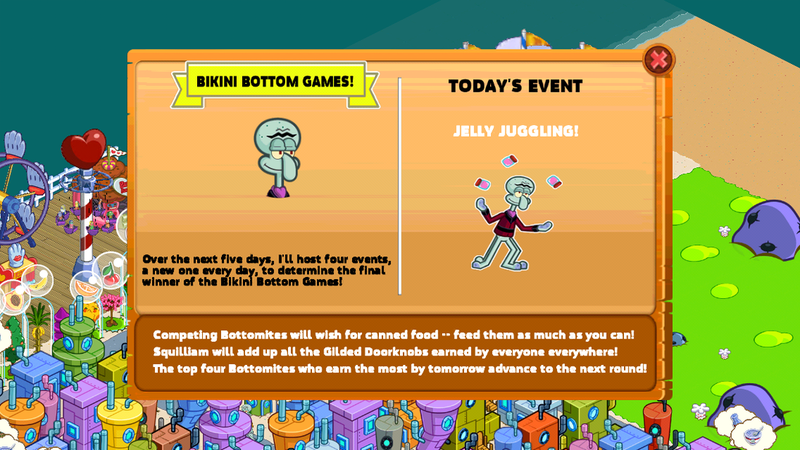 Bikini Bottom Games 2014 Event Guide! 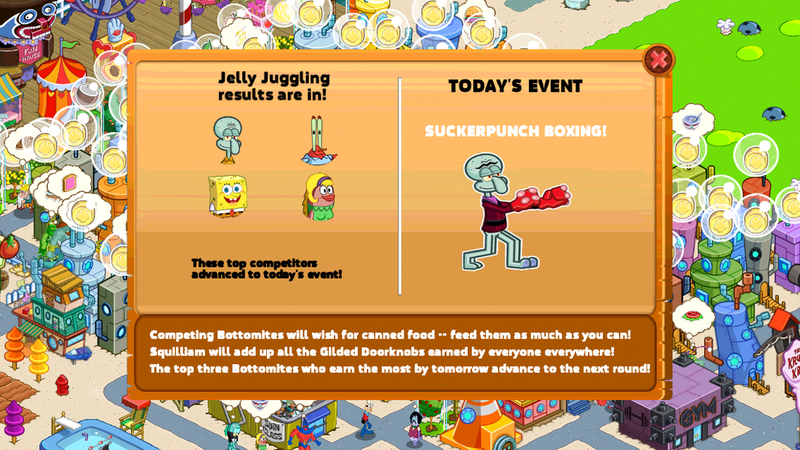 On July 10th, Nickelodeon pushed Version 4.10.00, bringing to players an all-new event titled the "Bikini Bottom Games". This event also took a similar approach to the Valentines' Day Update in February of 2014, re-introducing the Community Event. Let's not forget the Bikini Bottom Games that took place! Overall, it was a fresh new experience in the game. Hopefully, the Bikini Bottom Games will return next year! 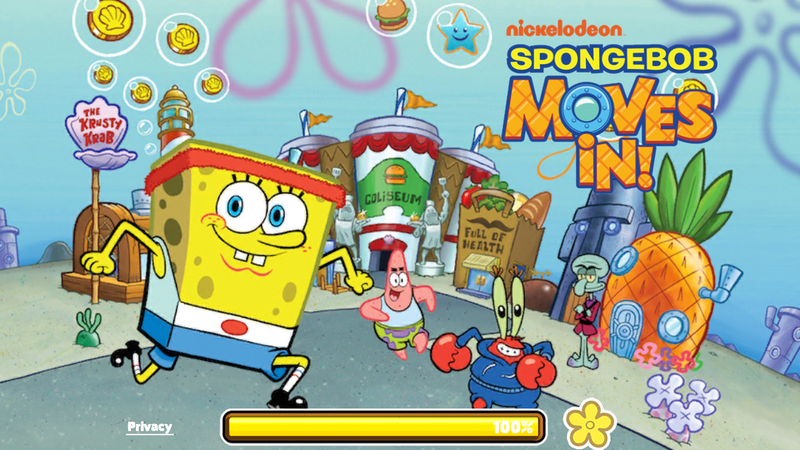 Check Out all the Awesome Goodness that took place in "SpongeBob Moves In" in July 2014 below! 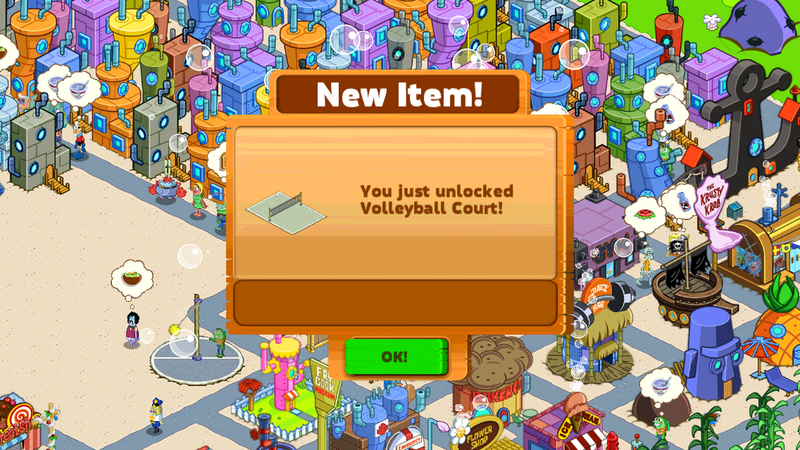 Create Your Very Own Sports Village! The most major attraction of this event was the ability to unlock Sports Facilities and create a Sports Village. Sounds simple right? Actually, it's really that simple! 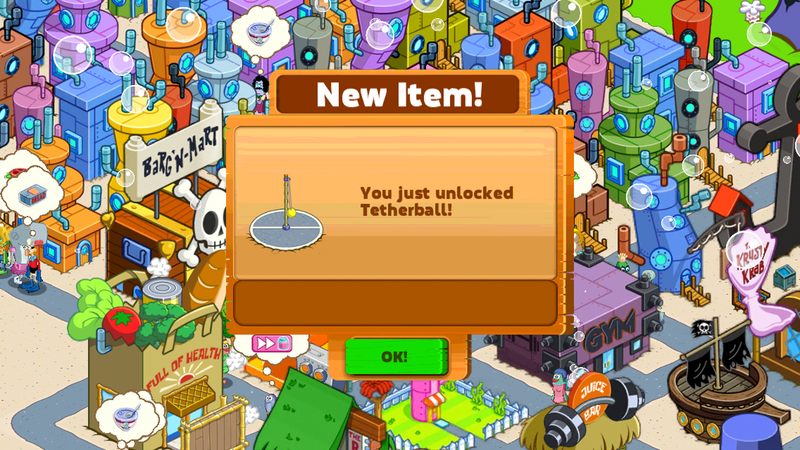 Collect glided doorknobs by feeding Healthy Goodies to Bottomites and use them to buy limited-time facilities. Let's not forget the facilities that you can unlock via the community event too! 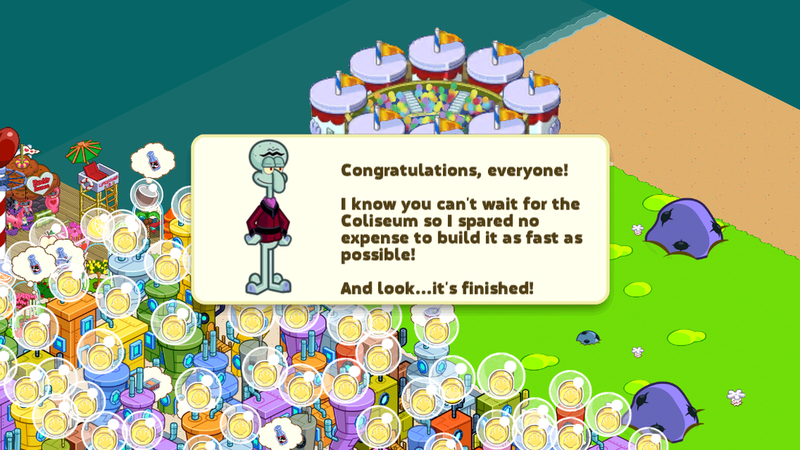 We've listed down step-by-step the instructions to complete the Bikini Bottom Games Quest-Line in our NEW Bikini Bottom Games 2014 Quest Guide! Visit It by clicking here! Also, we have an extra section all about the items you can obtain a few sections down. Get buildin' now! Where's the Full Of Health Store? 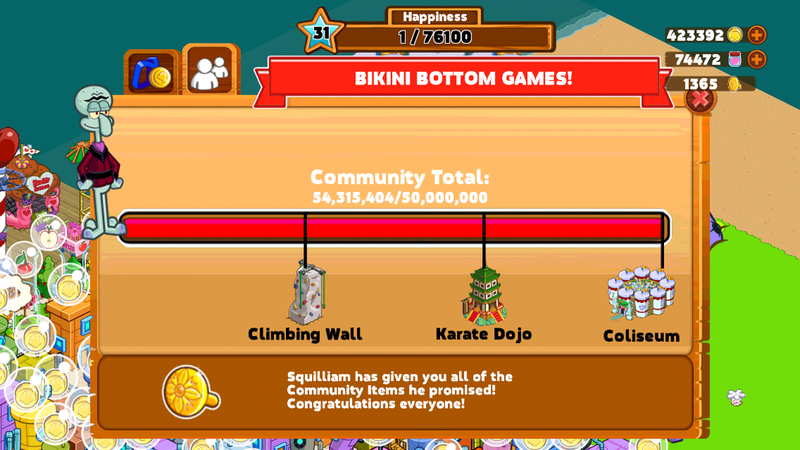 Squilliam arrives in Bikini Bottom, which is kinda weird, especially if you already have him moved into your town. Nonetheless, he's looking for a "Full of Health" store. Does Bikini Bottom have one? Not exactly, until you Move it In! After doing so, you can now make your own cans and use them as ingredients to make Healthy treats, including the classic, Canned Bread from episode 26b, Squidville. Aside from that, you can also make Canned Milk and Squidflakes. Feeding bottomites with these treats earns you special Glided Doorknobs. What they are used for will be elaborated on below. 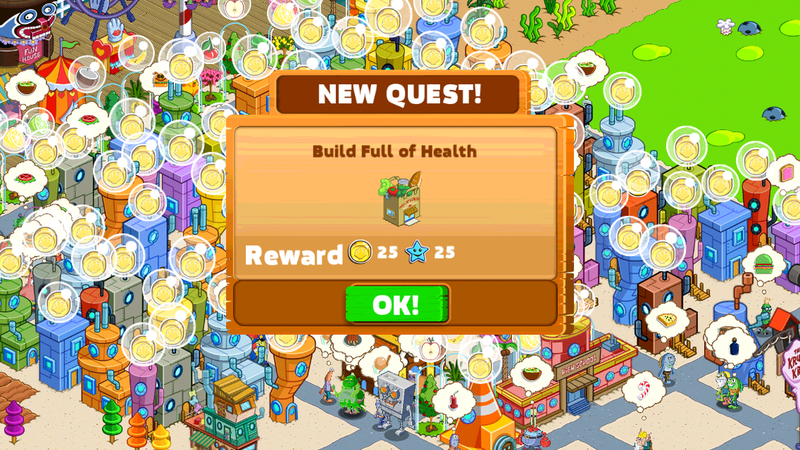 The Full of Health store remains in your town after the event ends, just like most other event buildings. Bikini Bottom Gets Sporty! Unlock Individual Items! We mentioned a little about the Glided Doorknobs above, and now we're gonna explain. Glided Doorknobs, like Hearts from the Valentines' Day Event can be used to unlock new Sporting Decorations. With this release, there are a total of 6 limited-time only Sports Facilities that you can unlock in order by using the Glided Doorknobs earned via feeding bottomites with food from the Full of Health Store. 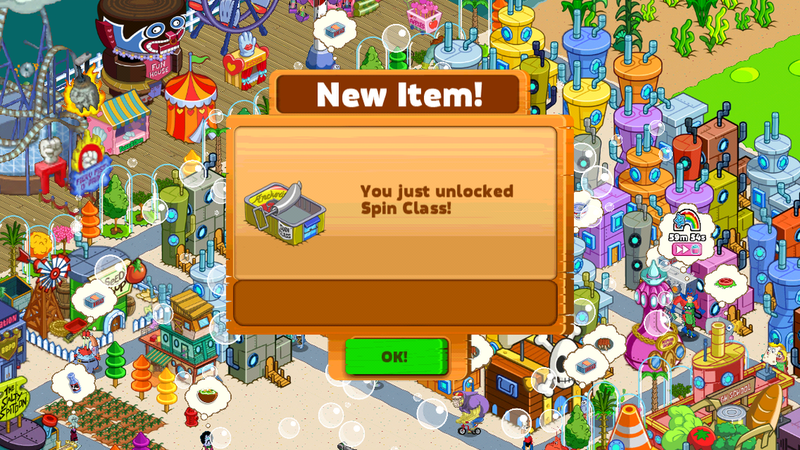 Note that you could unlock the Rides using Jellyfish Jelly as well. You can move these facilities into any part of Bikini Bottom. Also, check out the Community Items available below! Keep Fit as a Community! Unlock Community Items! 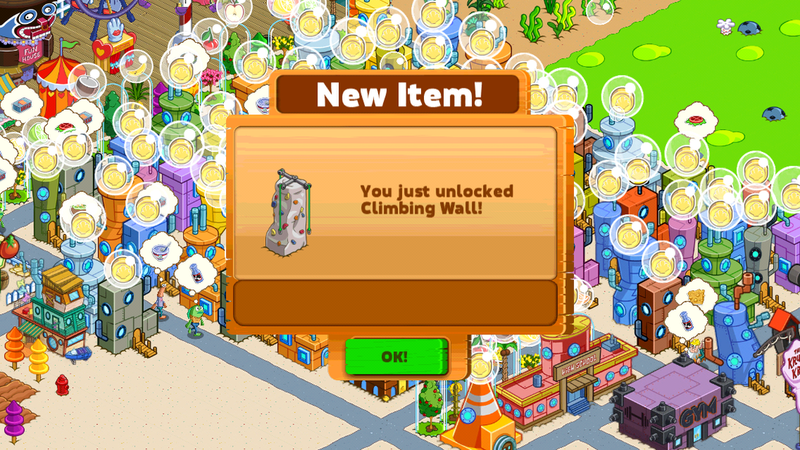 Similar to the Valentines' Day Event, players could work together to collect doorknobs and eventually unlock FREE and EXCLUSIVE Sports Facilities for your Bikini Bottom! These items are totally different from those that are under the Individual Category. 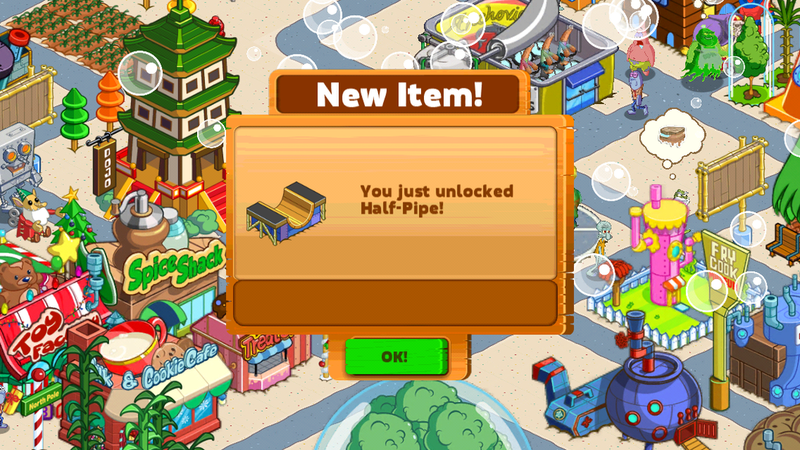 Achieving certain milestones in terms of the number of doorknobs collected worldwide unlocked several different facilities that were awarded to all players. Upon unlocking the Coliseum, players would receive two plots of land in the north of the town where the Coliseum was automatically placed at. It took 4 weeks to reach the goal, but it was well worth it! To all players, thanks for helping out! 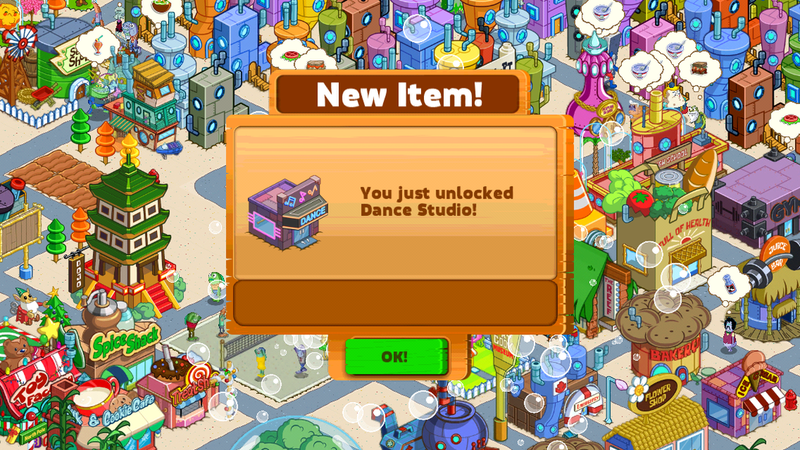 There were three facilities in total to be unlocked with this feature. 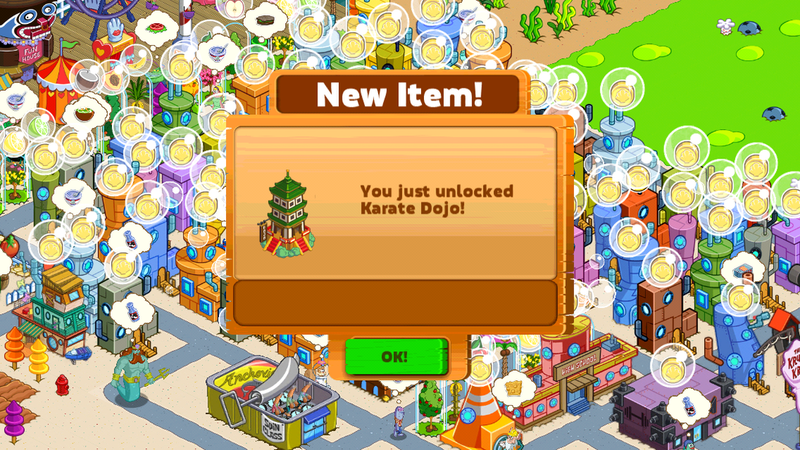 Will Nickelodeon bring back the Community Event in future updates? We'll see! 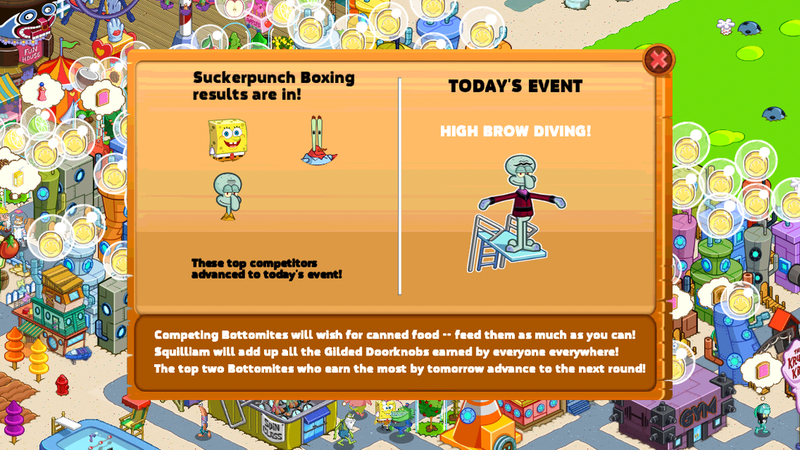 After the Coliseum was unlocked, Squilliam kicked off the First Annual Bikini Bottom Games, with 4 competitions in all. IN order to support a particular character, you had to feed as much food from the Full of Health Store to the candidate. The characters with the highest amount of doorknobs would move on to the next round until all but one competitor has been eliminated, The character left standing at the end of the four competitions would be titled as the winner. And the winner is...SpongeBob SquarePants! This event was no doubt one of the most complex events held in the game so far and it will continue to be for the updates to come! Now, who's already preparing for next year's Bikini Bottom Games? Q: I Don't Have Enough Land, How Do I Get More? A: If you are out of space in your Bikini Bottom, you can store some decorations in your inventory so you have space for the new animating decorations for the Bikini Bottom Games event. Q: Who is the Daily Winner? A: During the events the daily winner could be someone that you don't have in your town depending on the popularity of that character. If you want to help that character, you will have to level up or spend jelly to unlock that character. Q: When Does the Event Start? A: If the Coliseum is unlocked, get ready for daily events where you can feed your favorite characters to have them win the event each day. 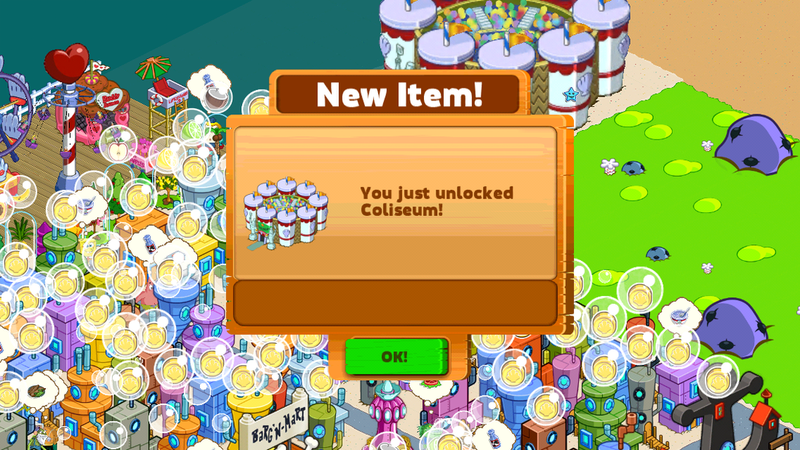 The Coliseum is a unique decoration that will appear automatically in your town, not in your inventory! 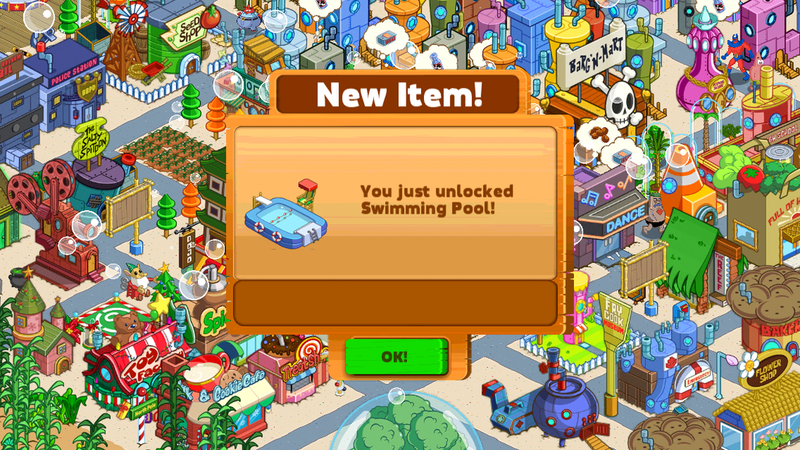 Q: How Do I Unlock the Bikini Bottom Event Items? 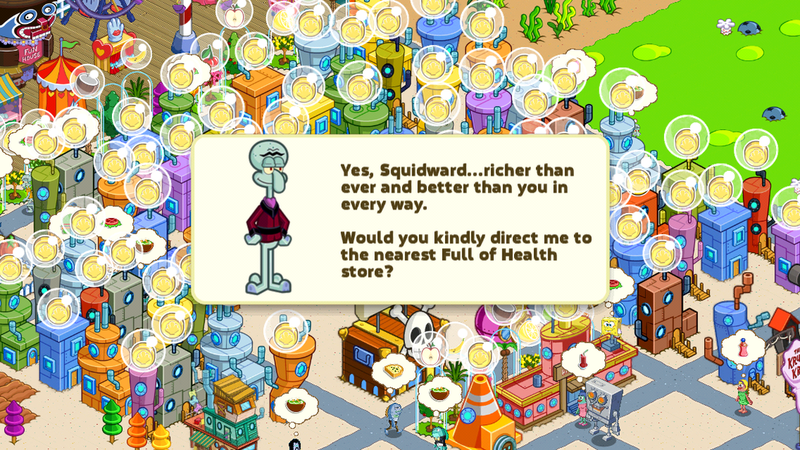 A: Make sure feed the bottomites Full of Health items when they ask for them to collect Gilded Doorknobs to unlock items during the Bikini Bottom Event. You as the player will unlock individual decorations and also contribute to the community total of gilded doorknobs to unlock the three main big decorations (including the coliseum)!